Few things are as quintessentially American as fly fishing in the Appalachian Mountains. It’s in the hills of North Carolina, Tennessee and West Virginia where the art of fly fishing just seems to make sense in the universe. 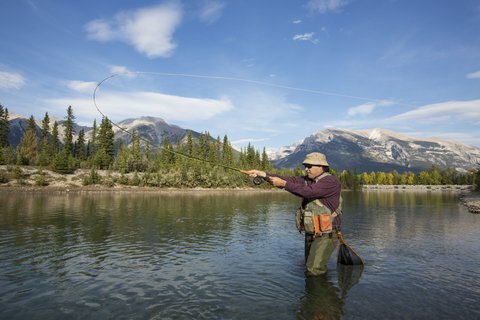 Here are five fly fishing top spots to get your line wet. Part of the Blue Ridge Mountains in Virginia, Shenandoah National Park has some of the most beautiful wild trout left in the Appalachians. The National Park Service and conservation groups have worked hard to restore the native brook trout, Appalachia’s only native trout species once near extinction. Back in the day, Herbert Hoover was known to fish The Rapidan River within the park, but the more adventurous fishing can be found in higher elevation streams. Straddling the border of North Carolina and Tennesse, Great Smoky Mountains National Park is the most visited national park in the United States. Its heavy rainfall, on average more than Seattle, feeds a healthy trout population. Fishing in these parts of Western North Carolina are where great American fly fishing legends were born. Fishing higher elevation streams like Hazel Creek, Deep Creek, Abrams Creek and The Little River in summer can be a good bet. The Pisgah National Forest comprises more than 500,000 acres of wilderness. Most of the fly fishing is done near Brevard, North Carolina on a section of the Davidson River near The Bobby Seltzer State Hatchery. For more untouched trout fishing, head upstream of the hatchery. The high elevation streams are best in the spring and fall. The Chattooga River is best known for the setting of Deliverance, a novel by James Dickey turned into a movie. For fly fishing it’s one of the most prestine rivers because of a federal Wild and Scenic designation. Above the Highway 28 bridge is virtually untouched. The fishing sections of the river travel through three states, Georgia, South Carolina and North Carolina, so knowing where you’re at and having the right fishing license is essential. Cranberry Wilderness in the Monongahela National Forest is said to be among the wildest places in Appalachia. The only way to reach this nationally designated wilderness area is by foot or horseback. For all the effort it take to get there will soon be worth it when you catch a trophy fish in such a beautiful setting. But don’t let your guard down as this is bear country. Check out the Cranberry or Williams Rivers for your best bets.